Dalesgate Hotel01535 664930work01535 611253fax HotelSituated on the edge of the Yorkshire Dales, Bronte Country & only ten minutes drive from the market town of Skipton; the Dalesgate Hotel offers the ideal base for business & pleasure long or short term. A charming privately owned independent hotel part of which was the residence of the minister to the chapel which stood on part of the site. It is now extended to provide 19 en-suite bedrooms with all the usual amenities. The Dalesgate Hotel is close to a number of Golf courses, the Steam railways of Keighley & Worth valley and Embsay. The Hotel is a mile and a half outside Keighley but in the countryside. 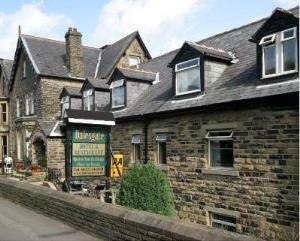 The 2* AA rated Dalesgate Hotel is located in the village of Utley 2 miles north of Keighley, the ideal base for business or pleasure. An electric charge point for cars is now available for guests. The hotel is located on the B6265 Keighley to Skipton Road 1.5 miles from Keighley Centre. Rail travellers can travel to either Keighley or Steeton Station. There is a taxi rank at Keighley Station. We are on the bus route for services to Skipton, Silsden, Ilkley and Burnley, so there is a frequent service.